We currently accept Cash on Delivery, PayPal payments & Bank Transfers. How much are the delivery charges and how long does it take? We charge a flat rate of RM15 for deliveries within Klang Valley. We delivery everyday except on Mondays (& selected Public Holidays). How are my orders packed? All orders are packed into styrofoam boxes. 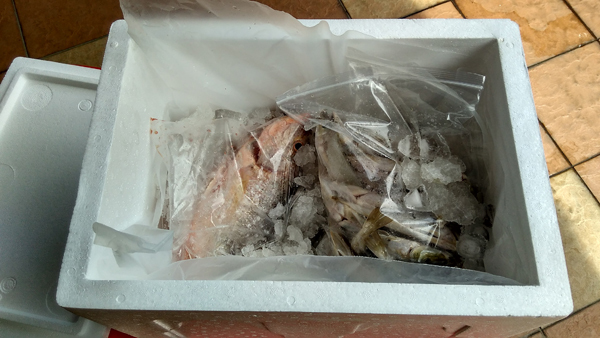 Each seafood type is packed nicely into a plastic bag & fitted into the styrofoam box which are then filled with ice to maintain the freshness of the seafood. Yes, you may only change or cancel your order 1 day before your order delivery. Can I add another delivery address? Or can I change my last delivery address? During Checkout you can either change your last delivery address, or you can add another delivery address. If you add another delivery address, you can give this new address a name (e.g. Mother Home). All your delivery addresses are saved in your profile and at your next shopping you just need to select which address you want to use. How do I check if my order was successful? You will receive an automated email confirmation of your order once it is placed. Sorry, you won't be able to place an order for a product that's out of stock until we have updated our stock. Delivery time is between 2pm and 10pm. You decide the time you receive the delivery. You will have to contact us at 0111 23 08 4 08 or email us at sales@myseafoodmart to reschedule your delivery. An additional delivery fee of RM20 will be charged for your rescheduled delivery. Can I go to your office & select the seafood I would like to purchase? No, we do not keep stock of any seafood at our office to maintain the freshness of our seafood. Where is the seafood sold on MySeafoodMart.com from? All the seafood sold on MySeafoodMart.com is sourced directly from Pulau Ketam. What if the seafood I've purchased is not fresh? All our orders are delivered directly from Pulau Ketam on the day of delivery and the seafood are caught approximately 6 hours before delivery so our seafood is definitely fresh.